Watermelon is 93 percent water, and no matter how firm it is when you cut it, its flesh will lose its integrity and deteriorate in quality rapidly once it is exposed to air. Because of this, it is important to choose a watermelon that is as firm as possible before serving. Watermelons may become soft for a number of reasons. Watermelons may become soft due to a variety of factors. Watermelons that are too ripe have soft and mushy flesh. While an experienced grower can determine the ripeness of a watermelon from outside appearance alone, it is not an easy task for the inexperienced gardener. Other ways to gauge the fruit's ripeness include a change in color where the melon rests on the ground from green to light yellow and a change in the color of the tendrils near the fruit from green to brown. The most common method is to thump the watermelon lightly; a hollow sound indicates ripeness while a muffled, dull sound may indicate over-ripeness. Gummy stem blight, a disease caused by a fungal pathogen, results in the formation of brown, soft, circular lesions on watermelon. The lesions may be 4 to 6 inches in diameter and may ooze. The disease requires fungicide applications for control. Blossom-end rot, a condition caused by calcium deficiency, results in the blossom end of the fruit turning from pale green to brown then black. The affected areas grow in size and develop sunken spots on the surface of the fruit. Liming the soil to increase calcium content, maintaining even soil moisture to enable the uptake of calcium by the plant's root system and foliar applications of calcium help manage this disease. Rough handling, during harvest or transport, may cause watermelon to bruise, promoting soft spots, decay and a short shelf life. Refraining from tossing or pitching the fruits will help avoid injury; take care not to drop them. According to the University of Georgia, a drop as little as a distance of 8 inches can result in severe internal bruising, and a 1-foot drop can crack the flesh internally. Watermelons should not be stacked on their ends as the blossom end is delicate and prone to bruising. Direct sunlight can affect the quality of watermelon after harvest. Melons left exposed to sunlight will develop sunburn rapidly. Keep the fruit in shade, after picking it, until you can store it long term. Heat may also affect the quality of the fruit. Temperatures above 90 degrees Fahrenheit can cause internal flesh breakdown and increase decay, causing the melon to become soft. 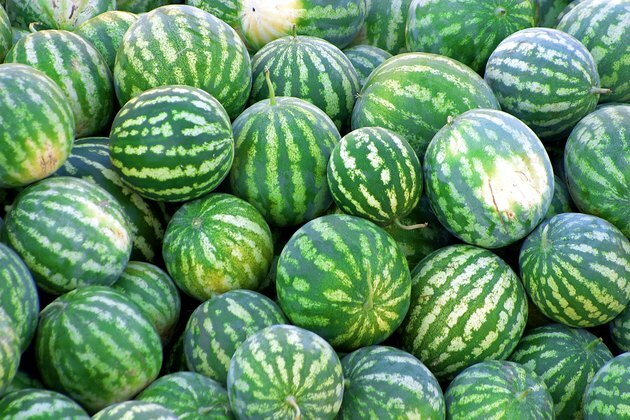 The ideal temperature for storing watermelons is 50 to 60 degrees Fahrenheit. Store watermelons in a dry place; high humidity can encourage stem-end rot.